You see a lot of strange things when you’re driving a bus; some sad and some uplifting. One such time was certainly in the latter category. I knew about Pirate Day 2011, Penzance’s attempt to claim the world record for the most pirates in one place…my daughter and grandson were attending…but I had to work. And that was it; I had to pick up piratical pensioners in Paul village and baby buccaneers in buggies with their proud pirate parents in Newlyn…to take them into Penzance which was turning into a town full of pirates…pirates outside pubs, pirates coming out of shops…even one progressing up Market Jew Street in a mobility scooter made to look like a pirate ship complete with fluttering Jolly Roger. Arriving at the terminus I witnessed the swashbuckling hordes disgorging from Penzance railway station. It brought it home to me that it wasn’t all about Penzance…this was Cornish pride at its best. It was a wonderful day and the world record, ratified by the Guinness Book of Records, was brought home to Cornwall. That was then and this is now. Hastings, a lovely town in Sussex, has taken back the title and on May 26th, the Spring Bank holiday, Penzance will once again try to claim back its rightful crown. So when I heard about the Be A Write Pirate writing competition organised by The Penzance LitFest in conjunction with Pirate on the Prom Day; there was only one thing I was going to write about – the passion of these pirates of Penzance. 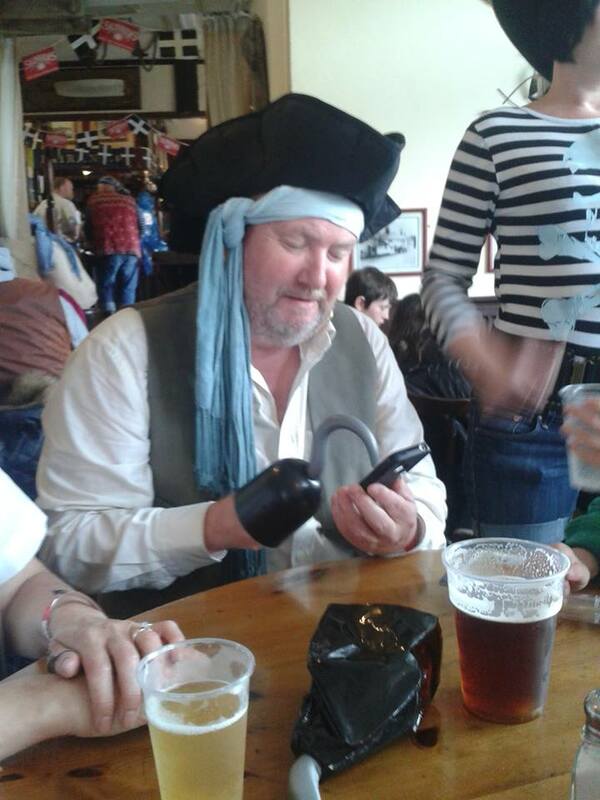 My poem ON BECOMING A PENZANCE PIRATE picks up on a man, a sometime poet, who is press-ganged by his family into taking part in Pirate Day. His subsequent acceptance and downright enthusiasm for the event is much how I felt from my peripheral involvement with the event last time it took place. This time I’ll be there and there’ll be seven family members with me…standing up to be counted. The poem is also a spoof on The Modern Major General’s Song from Gilbert & Sullivan’s The Pirates of Penzance and is written to the same rhythm so that it can be sung. Poetry is something I have come back to recently, being inspired by the likes of John Cooper Clarke (caught the legend in Penzance the other week) and Nauseous from Up Pompeii!. I’ve always been proud of my Cornish roots. The Lightfoot brothers, who were hung for murder at Bodmin in 1840, were nephews of one of my forebears. With a Penzance heritage from my mother’s side of the family, I have a natural passion for Cornwall and all things Cornish. Holidays at grandma’s cottage near Looe, meant that as a little boy all I wanted to be was a bus driver in Cornwall. Fifty years later…I am one, but the journey has been meandering one…much like many of the routes I drive now. Tourists on the bus often remark that my northern accent isn’t very local, I just smile and say, “That’s right, I’m from north Cornwall”. The Lightfoot brothers only managed a crowd of 14,000 for their farewell performance at Bodmin Gaol; they put special trains on for the event. We’re hoping for a lot more on Pirates on the Prom Day on May 26th …and a happier ending.